1. Preheat the oven to 200°C, gas mark 6. Place the fish in a small roasting tin and roast for 15 minutes or until just cooked through. 2. Meanwhile, mix together the cucumber, avocado, chilli and coriander. Whisk together the juice from 1 lime and the oil and toss into the salsa. Season. 3. 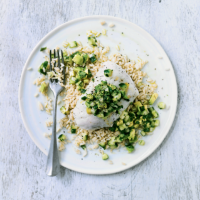 Microwave the rice according to pack instructions and top with the cod then spoon over the green salsa and serve with the remaining lime cut into wedges. This recipe was first published in Thu Mar 16 09:09:00 GMT 2017.